Forgive me for having a Women's Weekly moment, but would you look at what I whipped up in the kitchen the other morning? This cider crumble slice came out of the oven looking fit for a country cookbook. The recipe asks for alcoholic cider too, so it's a wonderful excuse to have a drink while you bake (come on, it would be wasteful not to). 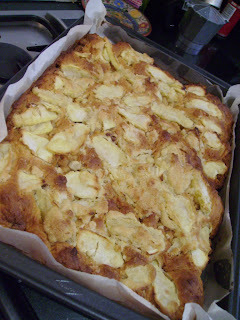 The recipe produces a doughy base from a small amount of butter, heated cider, flour, egg and ginger. One then melts more butter, along with sugar and golden syrup, stirs in a cored, sliced apple and spreads it on top of the base. Finish off the bottle of cider while it's baking! While we're talking cider, is everyone aware of Henry of Harcourt? They produce exceptional apple and pear (Perry) cider. Any very long-term readers would know of my delight in pear cider, discovered in Estonia, and I'm thrilled to be able to source it here from such a commendable producer. Hey Foodiefi, not sure if this is the appropriate channel, but what are you feelings about date scones? I approve of dates, and I approve of scones, but the combination of the two is not one of my culinary faves. Sticky date pudding, on the other hand, is something I like to cook. And I love dates in a slow baked Moroccan stew. See, I would always have avoided date scones. Frankly, because I don't know what a date is. It sounds kinda dirty. But I was suddenly compelled to try one two weeks ago and I haven't looked back. I've also discovered that they're extremely forgiving; they can turn any old thrown together crap scone batter into a really nice scone. I'm so amazed. I normally hate fruit. They are a fruit, right? I'm glad we are talking about fruit. Given the theme of your blog I had a moment's pause after I posted my response as to whether we were talking about the same thing. Dates are indeed a fruit, but they're not your average healthy comestible, since they grow on a palm tree. Good to hear that they're making Scone a better place for you.